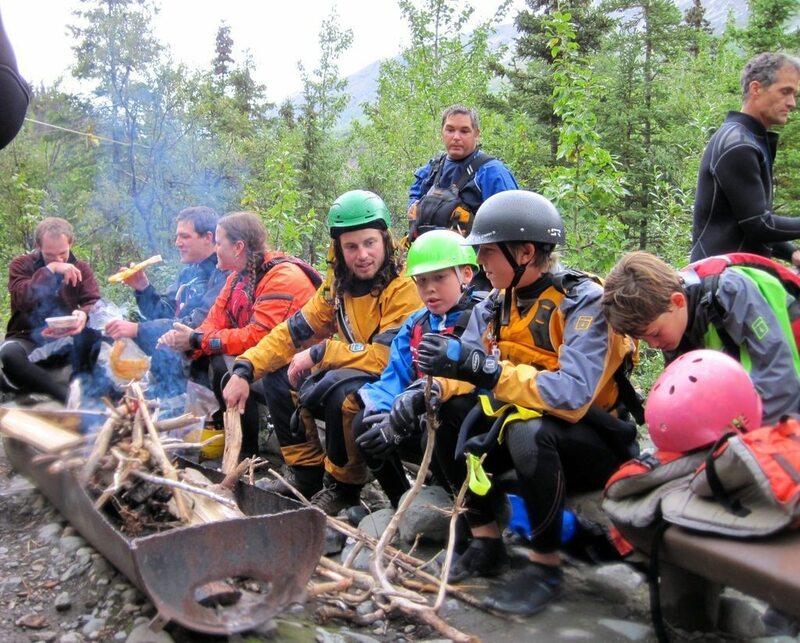 We did a family trip on the Upper Tatshenshini River yesterday as part of the Yukon Canoe and Kayak club’s youth program. 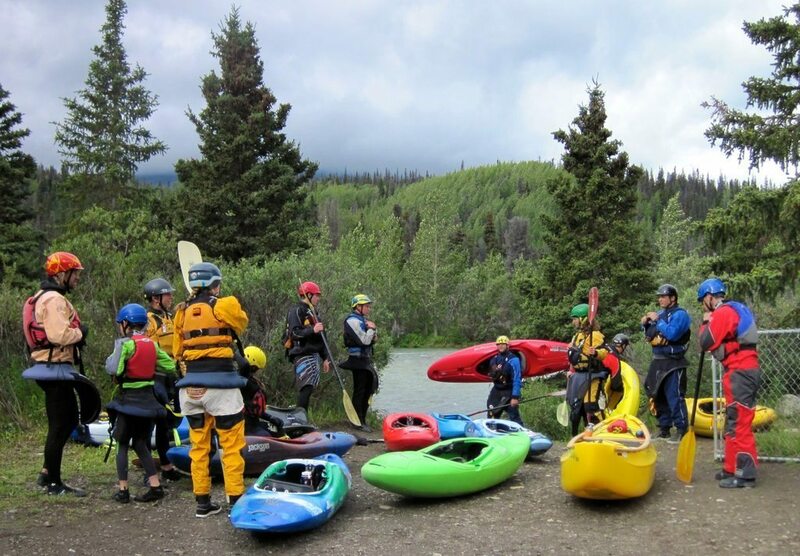 Thanks to the great folks at Tatshenshini Expediting, we were able to tag along with a commercial group and have raft support for the kids so they could raft some or all of the river. 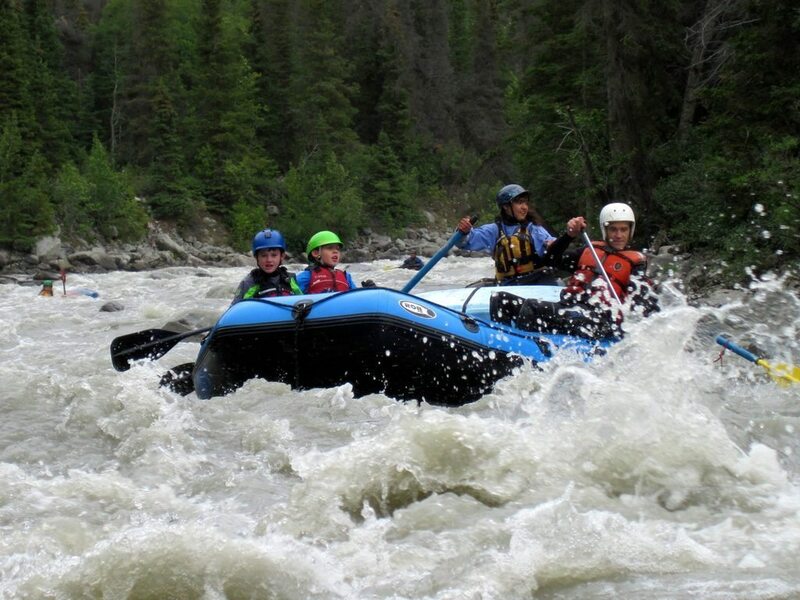 The “Tat” is 2.5 hours south west of Whitehorse via Haines Junction and you end up being on the river for about 5 hours which makes for a very long day. While the surroundings are like postcard photos, it is a glacier fed river so the water is chilly and being smack in the middle of the Haines summit often results in cool and wet weather. It is a class 2-4 river with lots of variety and relatively fast moving water. It’s mostly a mix of class 2-3 with the major area being a section that holds 3 class 4 features, approximately 2/3 through the run. 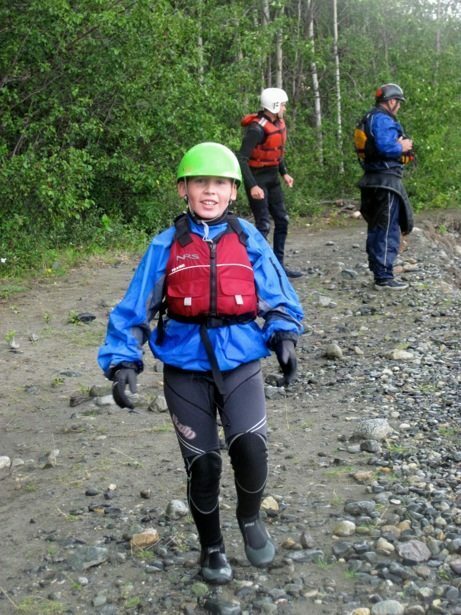 We have had a great summer of paddling with Hunter continuing to grow and improve, even to the point of deciding to participate in our upcoming local kayak rodeo event. With a full slate of winter paddling already planned, we decided to not push him. The rafts left first and when we came upon him 15 minutes later, the first words out of his mouth to both of us was “next time I am soooo paddling this in my kayak”! Hunter had the run of the raft and was actually paddling the oar rig by the end of the run on the lower section, which thrilled him to bits. He finished the day happy, warm and excited to come back again which was our overall goal. 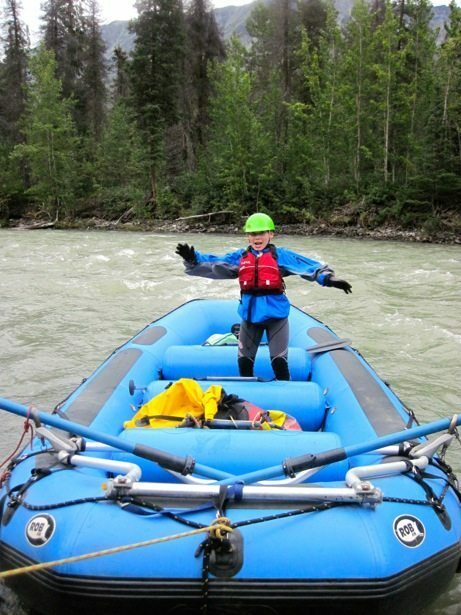 This was my first time paddling the river and I definitely had butterflies – although not worried about tipping over and ensuing death, I wasn’t certain about how fast and high volume the water was going to be and how much it would push my comfort zone. 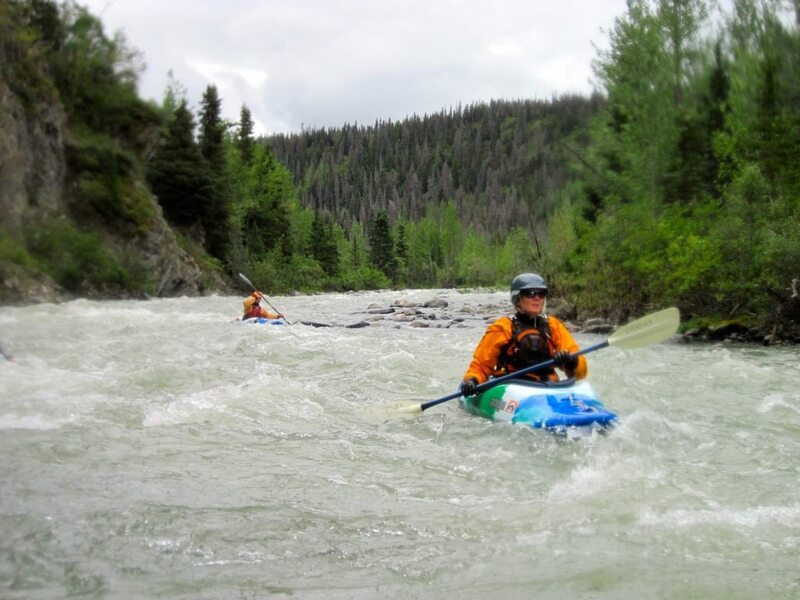 The first section of the run is on the Blanchard river which is pretty continuous whitewater (constant mix of class 2 and class 3) and lots of rocks to either avoid or Boof, depending on your skill and confidence level. The water is brown, which makes it really tough to see the rocks so you spent a lot of time river feature reading. Overall I had a relatively good paddle with no swims and 2 clutch rolls in some big water. One was in the class 4 section just above a hole so it was a bit nerve racking (hopefully video to come). As I’ve also been learning to roll with my eyes open (new as of the last month) I was amazed at how dark it was under the water. When I first flipped over you could see the light and then it was just black thanks to the high silt content. The YCKC volunteers did a fabulous job of leading the trip and keeping the kids safe and happy. Morning gear check and safety talk was rewarded with chocolate bars as was knot tying and safety talk #2 at lunch time. The kids were on a chocolate high all day. I think the last of it was eaten on the bus ride back to put-in. Overall it was a long fun day out on the water with friends. Hunter had a great day in the raft, I am happy to have now paddled the Tat (it wasn’t as hard or scary as I thought it would be) and Tim was able to get some play time in on the river as he didn’t have to worry so much about being the only safety resource for Hunter and I. Thanks again to the YCKC team for making it all happen!